There are many names for the thin skin that develops on our bodies as we age- crepey skin, thin skin, elephant skin or grandma skin. Most commonly called crepey skin, this type of skin is characterized by being loose and sagging. It is one of the most frustrating signs of the aging process, as well as one of the most common. So-called crepey skin is given that moniker as it closely resembles paper – specifically, dry, tissue thin and wrinkly crepe paper. Crepey skin on the body looks saggy and fragile, and can also be scaly. In scientific terms, it represents the thinning of the dermis and epidermis. Crepey skin is not the same as a regular wrinkle or laugh line. They develop differently, and have different underlying causes. Crepey skin first appears as tiny dots around the hair follicles, which later merge together and connect. While wrinkles are often caused by repetitive motions such as squinting, crepey skin is caused primarily by a thinning of the skin. Crepey skin can show up on the elbows, inside of the arm, neck, chest, legs, back of the hands, and eyelids. Anyone can get crepey skin but you’re more likely to develop it if you are fair skinned and have less melanin. Some ethnicities have thicker skin than others so they are less likely to develop it. Crepey skin tends to show up first on the back of the hands and décolletage, as well as under the eyes where the skin is naturally thinner. It tends to show up in the 40’s, but crepey skin could make an appearance much earlier due to genetics and sun exposure. One of the main causes of crepey skin is damage from the sun. Over time, exposure to the sun’s damaging rays can break down the elastin in the skin – this is what gives skin firmness and a bounce back quality. As collagen and elastin deteriorate over time, the creases and pores on the skin become more noticeable and start to give skin a saggy look. Another way to think of it is if skin were a rubber band that has stretched out and lost its bounce. The damage can result either from exposure to the sun or the use of tanning beds. Damage is often cumulative and develops over months and years. But the sun isn’t the only culprit. The loss of moisture in aging skin also plays a role as does sudden, significant fat loss especially in older people as aging skin cannot bounce back as readily as younger skin. Some medications can also contribute to crepey skin, such as steroids. One reason why crepey skin is more noticeable in older females is due hormonal changes, which also cause dry skin. Smoking is also highly damaging and can cause crepey skin, as the chemicals in cigarettes damage collagen and elastin. Smokers often have crepey skin around the mouth as well as back of the hands and eyes. Exposure to second hand smoke is also damaging, so the sooner you can quit smoking for your skin and health, the better. The position you sleep in may also contribute to wrinkles and creased skin. Sleeping on your side with your face pressed up against a pillow can lead to permanent creases. But it’s not only your face getting squashed and wrinkles. If you sleep on your side, your chest and neck area may also be getting creased. Try sleeping on your back if possible. It’s hard but you can also try a sleep positioning pillow. You know that sugar is bad for your health but it is also bad for your skin. When you consume a lot of sugar, glycation occurs- this is when a protein or fat molecule bonds with a sugar molecule. Eventually these form “advanced glycation end products,” or AGEs, which cause protein fibers to stiffen and its thought this can contribute to wrinkles and crepey skin. The single most important thing you can do to prevent crepey skin (as well as wrinkles and skin cancer) is to wear a sunscreen with an SPF of at least 30 every single day. Buy a daytime moisturizer with a high SPF or if you don’t like the feel of a cream, try a mineral based powder, which acts as a physical blocker to the sun’s damaging rays. Cover up on a sunny day, and be vigilant about protecting the neck and chest area, as well as the back of the hands. Invest in a rash guard for the beach and throw on a scarf to protect the delicate neck. Remember to reapply sunscreen every two hours. Skip the tanning beds as the UV radiation can lead to premature skin aging and skin cancer. If you love the look of sun kissed skin, buy a bottle of self tanner instead. Make sure to moisturize the skin and keep it well hydrated. Don’t overlook the areas where crepey skin can develop, such as inside the arms and chest. Look for moisture boosting ingredients such as hyaluronic acid, which works like a moisture magnet and can hold up to 1,000 times its weight in water, as well as glycerin and nourishing oils. Other deeply hydrating ingredients include shea butter, jojoba oil and coconut oil. Another way to keep your skin hydrated is by drinking enough water, as dehydrated skin can exaggerate the appearance of fine lines. Aim for at least eight glasses of water a day. If you’re trying to lose weight, do it slowly. Skip the aggressive weight loss plans or crash diets so your skin has time to adjust to weight loss and this will help prevent loose, saggy skin from developing. Eating a healthy, balanced diet can also help keep skin smooth, soft and supple. Choose lean proteins such as chicken and fish, and include fresh fruits and vegetables at every meal to get an adequate amount of skin-healthy vitamins and minerals. Load up on omega-3 and 6 rich foods such as cold water fish (mackerel, sardines), flax seeds and avocados. Omega 3s and 6s have anti-inflammatory properties and can help support the body’s collagen production. There are plenty of options for treating crepey skin, ranging from over the counter solutions to home remedies as well as the dermatologist’s office. 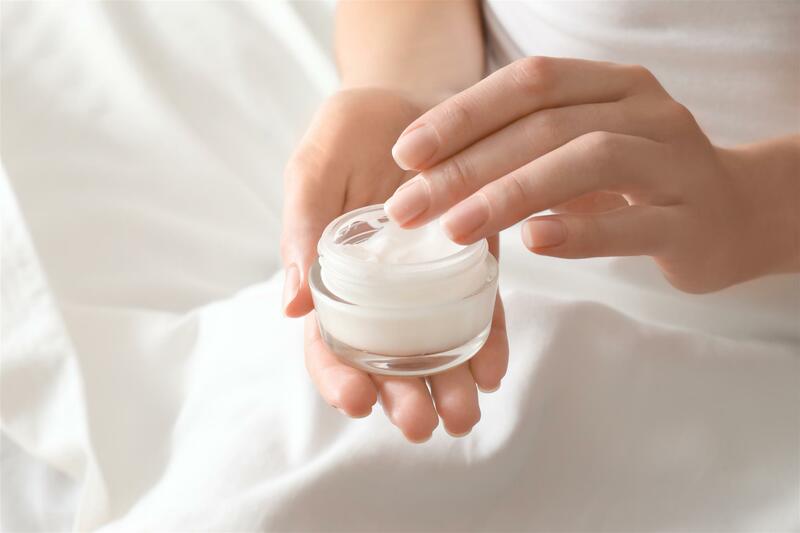 One challenge is that crepey skin can occur on multiple parts of the body, so different products may be needed as you wouldn’t use a facial cream on your leg and vice versa. Large body areas such as legs and arms should be kept moisturized and hydrated with a good body lotion. Look for one containing ceramides, as well as nourishing ingredients such as cocoa butter or jojoba oil and apply twice a day, especially after showering. For the face, look for creams and serums containing hyaluronic acid. It’s the ideal beauty ingredient as it leaves skin looking dewy and temporarily fills in fine lines to give skin a plumped up look. Other key ingredients to look for are collagen-boosting retinols and peptides, especially for the delicate neck and chest area. Retinol, a vitamin A derivative, works by boosting collagen production and encourages cell turnover to reveal smoother looking skin. It also helps to improve skin elasticity. Look for free radical fighting antioxidants and skin smoothing peptides. Exfoliation is also key to whisking away dead, dull skin cells to reveal smoother looking skin. Skip the harsh, grainy scrubs which can be damaging to delicate skin. A better exfoliating option is a gentle but effective acid peel, such as glycolic acid or acids derived from citrus. Another option for treating crepey skin is at a dermatologist’s office. Chemical peels and microdermabrasion basically work in the same way to improve the appearance of the skin. They both essentially remove the top layer of skin but a chemical peel can go deeper than microdermabrasion. Down time varies depending on the treatment. Light therapy and lasers improve skin texture by stimulating collagen production. Keep in mind that any cosmetic procedure can carry associated risks and recovering time can vary. Crepey skin is just one of the visible signs of aging. There are also fine lines, wrinkles and sun spots to contend with, as well as dehydration in mature skin. 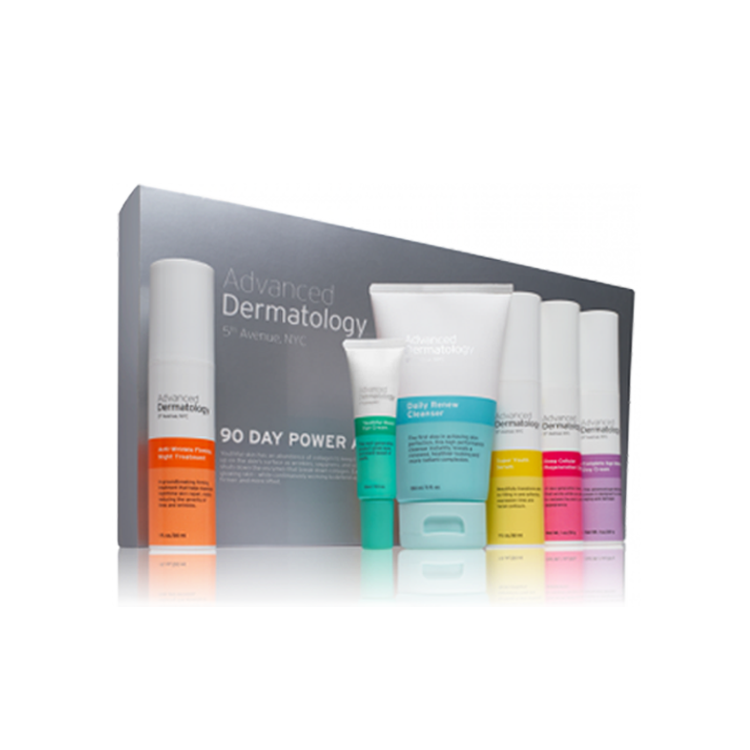 If you want to take the guesswork out of choosing the right products and when (and how) to apply them, a fool proof way is to purchase an entire skincare system such as Advanced Dermatology’s Regimen. The skincare system includes a cleanser, serum, anti-wrinkle treatment, moisturizer, day cream and eye cream- in other words, everything you need for glowing, beautiful, healthy skin. If you want smoother looking skin, skip the harsh exfoliants which can do more harm than good. 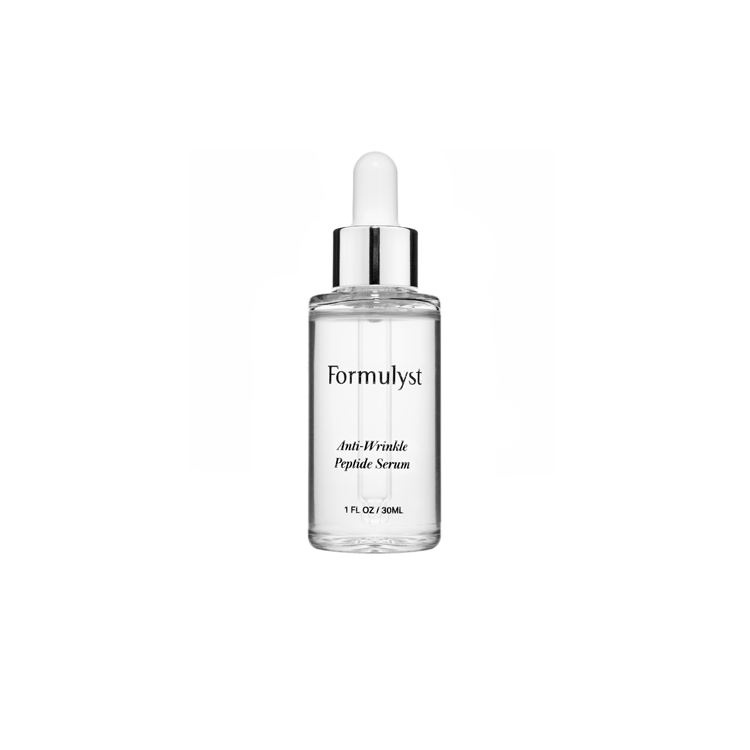 Formulyst Retexturing and Perfecting Serum is powered by gentle but effective alpha hydroxy acid (AHA) and beta hydroxy acid (BHA) which works to dissolve skin cells. Packed with plant based acids, apply this serum to the face and neck to whisky away old skin cells, leaving behind fresher, smoother looking skin. The serum also works to tackle unevenness and blotchiness. When your head hits the pillow, your body goes into repair mode. 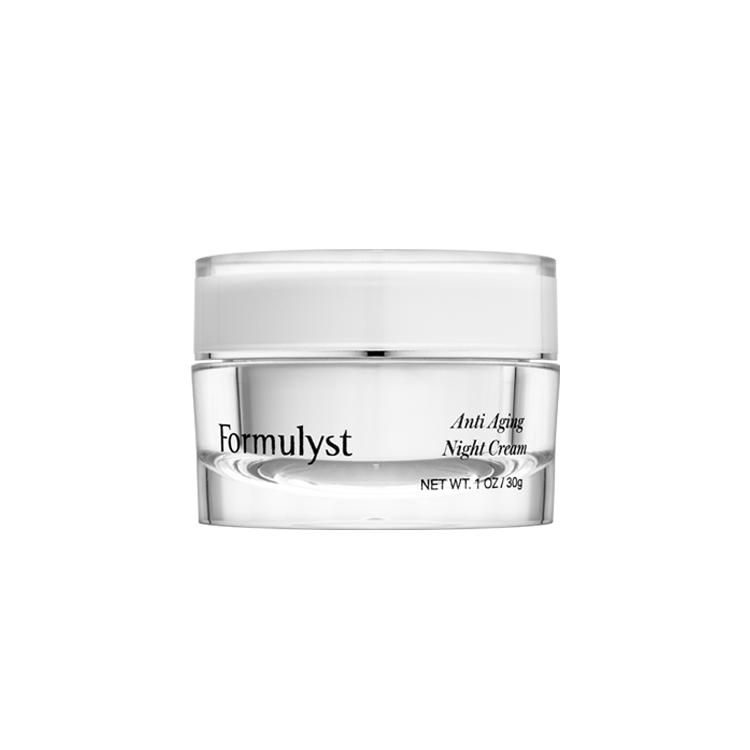 Give it an extra bit of ammunition for the repair process with a layer of Formulyst’s Anti-Aging Night Cream. The cream is powered by retinol, the gold-standard for anti-aging. This vitamin A derivative helps boost cell turnover and smooth out the appearance of fine lines and wrinkles while soothing safflower seed and jojoba oil seal in moisture. I would have stayed out of the sun if I had known what I know now. I hate my skin my neck, hands and arms age me. Very depressing. I just turned 70 and my arms look 80. I know we age but just not now. I see women older than I am and there skin looks younger then mine does. Any suggestions? Wonder if the other women received a response. If I had the financial resources I would spend it all to have yourger looking arms. I live in AZ and it’s hot can’t even feel good about wearing sleeveless tops. I am a very, very young looking woman over 50. I am still able to wear my hair long, my skin looks pretty darned good. I’m petite and my size is OK enough to still wear youthful shorts and dresses, People comment on my skin all the time, but they are looking at my face, not my body. You will not catch me dead in anything that shows my arms or my knees and I no longer put on a bathing suit (even with sunscreen). If you were to take a photo of my face and then a separate one of my knees and especially my arms you would swear they belong to two different people. My forearms have very deep wrinkles and my biceps are flabby, but worst yet, I have severe crepey skin on my entire arms. I recently saw the back of my arms in a photo and I wanted to cry. Every summer blouse and dress I see is sleeveless so I have to cover myself up during 100 degree weather. My knees are wrinkled also and I can’t wear shorts. I look all over the internet for a procedure that takes care of this and cannot find a thing. My arms are worse than most old women. My mom is 92 and her arms look similar to mine but I actually think mine are even worse. I just wanted you to know you are not alone.